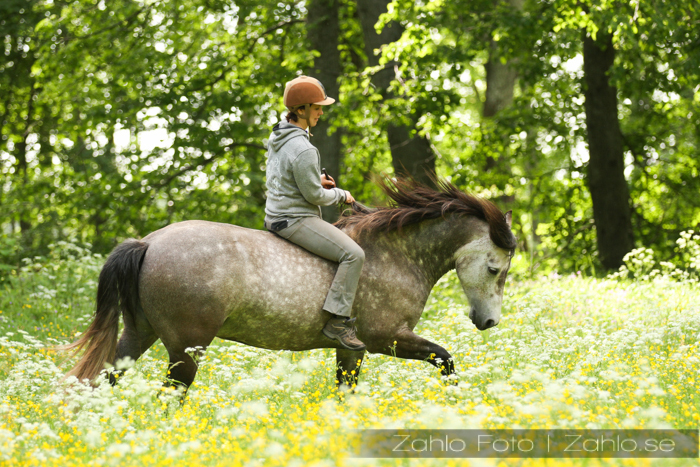 The horse - a dream come alive! Through centuries, we have been aspiring to understand horses since they have been a vital part of our daily lives. Even though we are no longer as dependent on the horse as before, a lot of people still find life without them impossible. I believe this is because the horse allows us to escape the everyday routine and lets us find peace and harmony. Therefore, it becomes more and more important to us to achieve a deeper relationship and communication with these proud animals who are always there for us with their sweet nature and soothing souls. The more we learn, the more the joy, understanding and security grow and the more doors are opened to us. Liberty Dressage? What is it? Why not horsemanship or clicker? come to me in every different position, eg come to me straight towards, move his shoulder or hindquarter towards me, move in sidepass towards me or back up towards me. Even though a lot of my own previous training has been focused on natural horsemanship, I have chosen to no longer use that name. 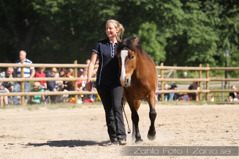 In natural horsemanship it is common practice to move the horse away from you, eg circling the horse around you. Since my way of training horses looks very different from traditional horsemanship I would like to avoid misunderstanding by instead using the name liberty dressage for describing the way I train horses. Similarly, I don't want to use the name clicker training, since I only occasionaly use a clicker or treats as reinforcement. So, in my liberty dressage à la Horse Vision, I first of all focus on getting the horse to relax and to let go of control. As soon as this is in place and the horse is calm, he is ready to listen to me and I can start the training towards a fantastic liberty dressage. One day while riding my beautiful Eamonn, it hit me that I now think differently about how I ride. Earlier my so called freestyle riding (without a bridle or halter) was very similar to western riding. I put a lot of focus on moving the hind quarters, shoulders, backing up, turning and so on. Obviously this is important, but today my goal is to help my horse find the same shape, balance and relaxation as in dressage, even if I am riding without a bridle or halter. Just like for Christofer in the Academic Art of Riding, my first goal is to help the horse to find his balance forward and down. With the horse in balance I start teaching him shoulder in and travers and helping him to find a higher form. I also train my horses to follow my signals when jumping without a bridle/halter. So, even though I ride without a bridle/halter, I focus more on dressage and jumping than on western riding. I also don't ride with a string tied around the horses neck, but rather use two sticks to communicate with my horse. In my opinion, the string often create too much pulling instead of using the seat. With the sticks, your seat is still your number one mean of communication. Who can practice and how? It is never too late to start improving on the communication between you and your horse and it is something that is achievable for everyone. It is up to you to decide how refined communication skills you need. Everyone is different with different goals in life. Some are content with being able to confidently lead and mount their horse, while others want to reach deeper into this world of equine communication. 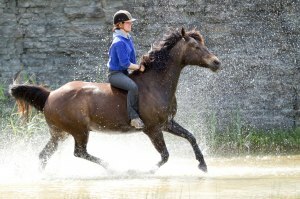 Communicating with your horse is important regardless of the age or breed of the horse. Everyone should try to learn understand how horses perceive the world. Through this type of training both you and your horse get more variation in your daily work. You build an even stronger relationship and reach a greater understanding for each other. 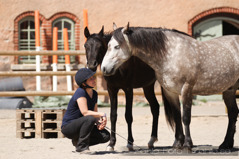 By building a common language, the horse learns to feel safe and to trust you. Don't be frightened by the myth that trick training develops bad habits in your horse. 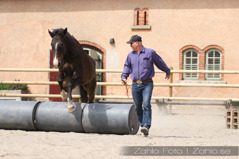 But start, as with all training, with giving the horse a good foundation to build your relationship on. 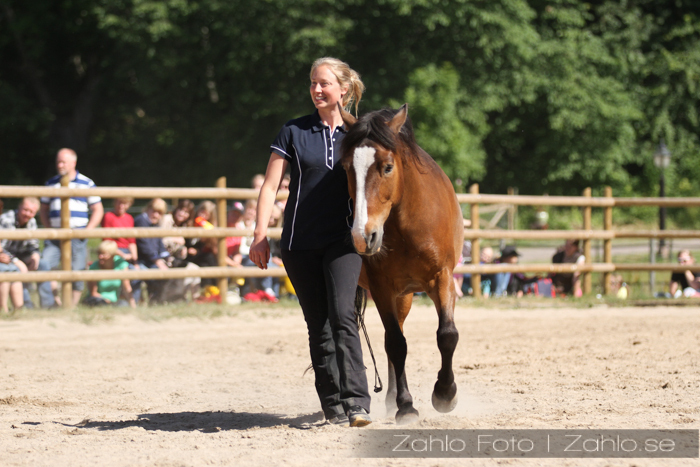 Remember that this training is aiming at improving the communication between you and your horse as much as possible.